Being primarily a history series and not a yokai series like Kitaro , Showa 1926-1939: A History of Japan doesn’t come with a Yokai Glossary except as included in the extensive notes section in the back. As the translator of the comic, I also put together this collection of articles on all of the yokai that appear. Here they are, in no particular order. 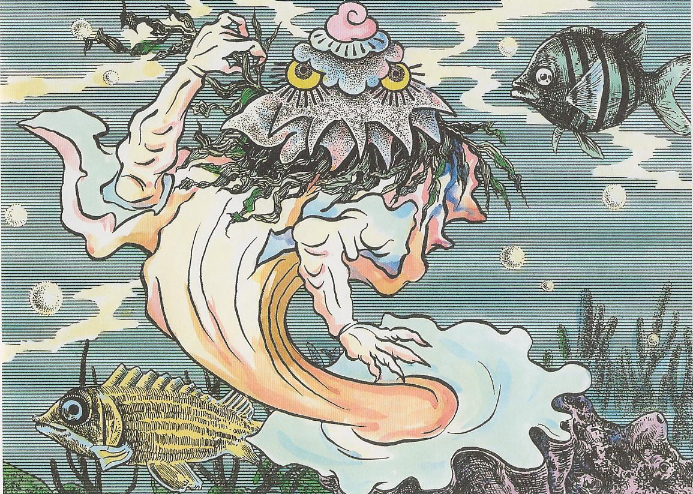 Click on the links to go to the individual articles and learn more about these amazing yokai! 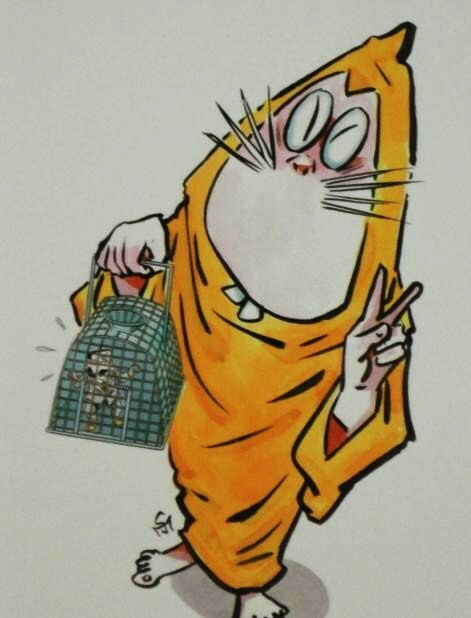 A Mizuki Shigeru original, Nezumi Otoko is the Donald Duck to Kitaro’s Mickey Mouse. A scoundrel and reprobate who does everything wrong, he is also Mizuki Shigeru’s favorite character. As Mizuki himself says, without Nezumi Otoko he has no story. 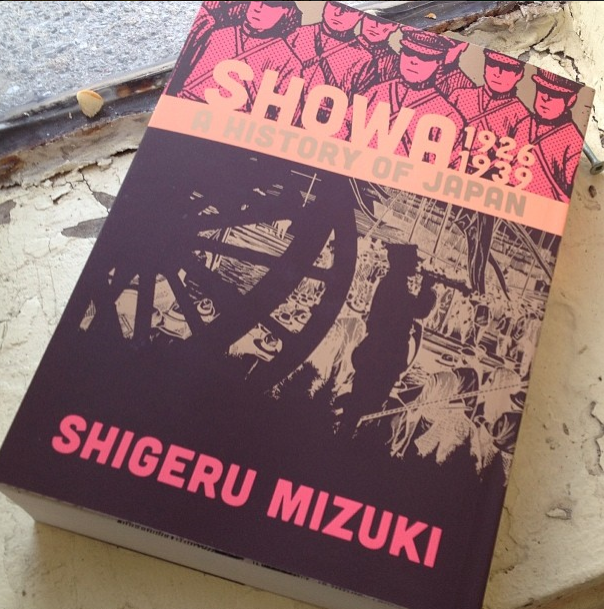 Nezumi Otoko is the narrator of Showa 1926-1939: A History of Japan, popping in occasionally to share some facts and to get the narrative moving to where it needs to go. He delivers some of the most profound dialog of the comic as well. 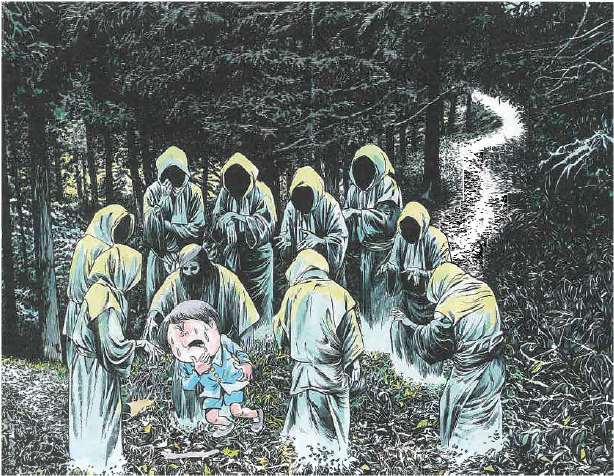 As a boy Mizuki Shigeru encountered the Hidarugami out for a walk in the woods. These spirits of those who died of hunger can cause the living to suffer the pains of starvation. A terrible, terrible ghost. Mizuki’s encounter with the Hidarugami as a young boy is quite poignant, considering how hunger would become such a defining point for the entire nation of Japan in the decades to come. The Sazae Oni only pops up briefly in Showa 1926-1939: A History of Japan, when Mizuki Shigeru’s mentor treats young Shigeru to his first taste of the sea snail sazae and warns him of the dangers of the Sazae Oni. 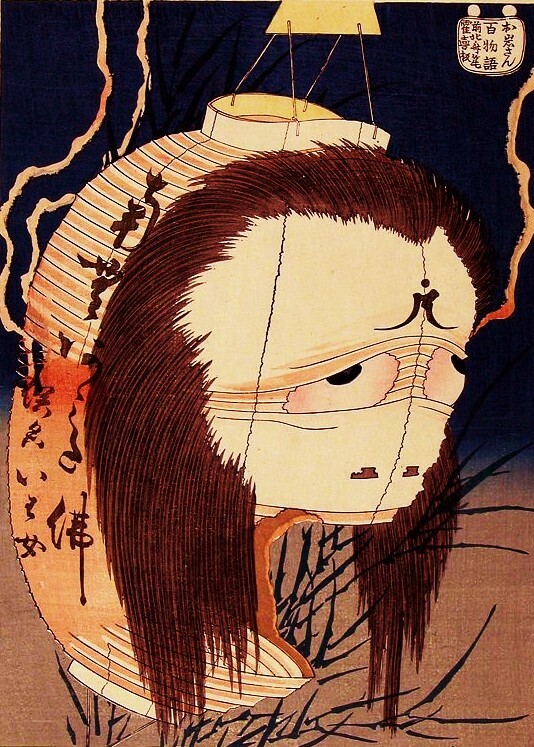 This shape-shifting Sazae Oni is one of the most bizarre in Japan’s yokai menagerie. I’m not sure who first saw this hard-shelled sea snail and imagined a seductive woman. 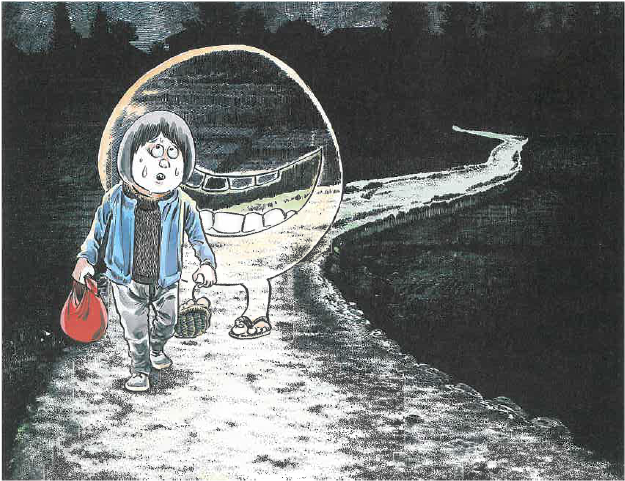 The phenomenon that convinces a young Mizuki Shigeru that yokai are real. One night, his friend and mentor NonNonBa tells a young Shigeru about the foxes in the mountains and how they hold their marriage ceremonies. When Shigeru hears the foxes in the mountains, he knows NonNonBa is telling the truth, and that yokai are real! 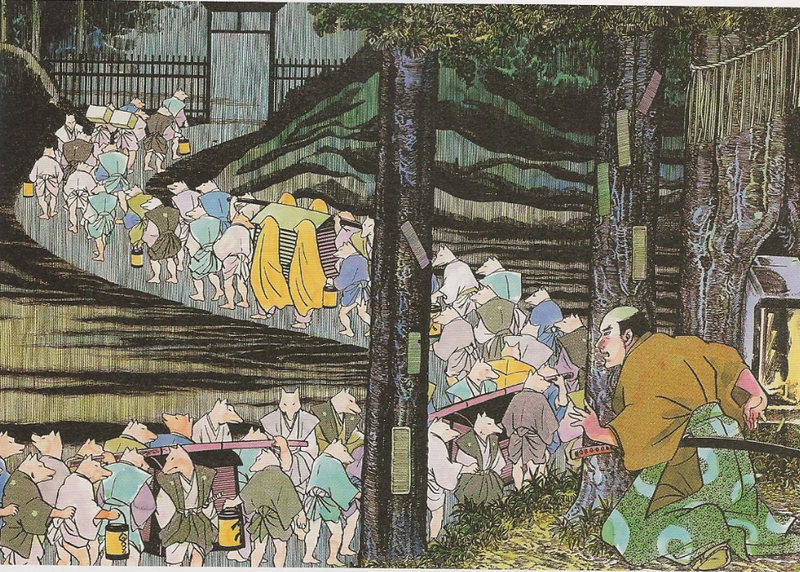 One of the least dangerous monsters in Japanese folklore, Betobeto San is the sound of footsteps walking behind you late at night. One evening Mizuki Shigeru and his brother have an encounter with Betobeto San, and the wise NonNonBa tells them what to do. 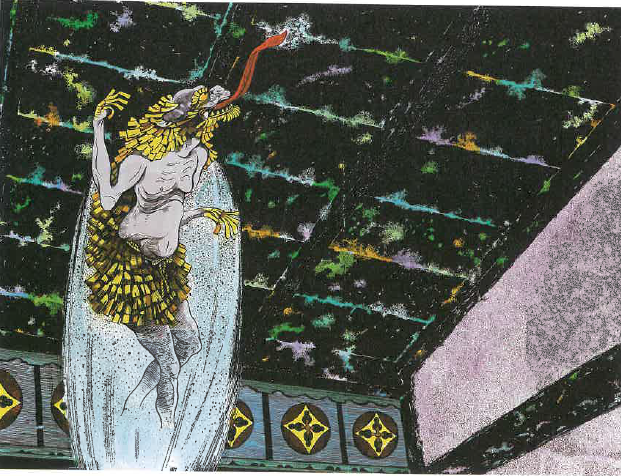 Another yokai story from NonNonBa, who tells the young Mizuki Shigeru about the monstrous Tenjoname who comes in the dark of the night and … licks the ceiling. OK, so that’s not very scary, and other authors have had to improve on the legend of the Tenjoname over the years. Previous Countdown to Mizuki Shigeru’s Showa 1926-1939: A History of Japan Next What’s the Difference Between Yurei and Yokai? Thank you! i am so happy that I have Russian fans! When I started this website, I had no idea it would be so popular with people all over the world. I read somewhere that if you see balls of fire in a field at night traveling in a line, that is the foxes marching to a wedding, carrying lanterns in their mouths.